Stamping Rules! : Scrapping Our Stash Blog Hop and Giveaways! Scrapping Our Stash Blog Hop and Giveaways! This month we are focusing on scrapping our Valentine's stash, or at least stash that has to do with love. I decided to dig deep into my stash of stamps that are spread all over the stamp pad as I get ready for the packers to arrive next week, and pulled out a beautiful retired stamp set from the Avonlea WOTG kit. I also learned to hem my own jeans this week (thank you, Pinterest!) so I grabbed a strip of denim to accent my embellishment cluster at the top of my card. The papers are new (Ariana) but left over from my frame project last week. I used the cute slanted sketch from Retro Sketches this week. We are thrilled to have Kiwi Lane Designs sponsoring this month! Kiwi Lane Designs creates templates that help take the frustration out of scrapbooking! And one lucky winner today will get a border set and an accessory set from Kiwi Lane. We are big fans of Kiwi Lane Designs and in fact have several members of our design team who either currently or in the past have been a part of their design team! Details on how you can win this prize are at the Practical Scrappers blog! I'm giving away some stamps of my own at the bottom of this post! Now, for my giveaway! I'm cleaning out the stamp stash, so I have 7 new and unused CTMH retired stamp sets to share in this mystery bag giveaway! Hope you win something good! Lovely card, Wendy! 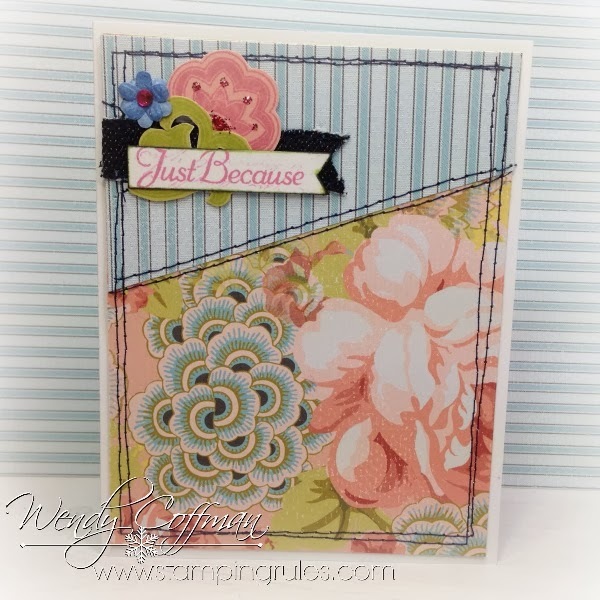 I love the papers, the embellishments and the sketch you used. Great job! p.s. thanks for a chance to win stamps too! LOL Love your sense of humor. Great card! This is beautiful - it immediately caught my eye! Your card is beautiful and I love the bit of sparkle you added. Lovely giveaway too. The flowers and stripes compliment each other so well! Gorgeous card! Such a beautiful card! I seem to hoard scrap paper. Lots of it. I have a hard time throwing away even the small pieces away! LOL!! What a great card! What do i hoard?? hmmm...I used to hoard brads..now it's washi, wood veneers, paper(!!)....eek! It can become a problem! :D! Oh my goodness, this is such a beautiful card! As for me, I kind of hoard everything...but especially paper! Lovely card--I like the use of denim. I tend to hoard paper. I love the papers you used in your card, but especially admire you for actually USING that paper because I just can't bring myself to cut into my favorites ones! Oh yes, and I hoard ribbon too! Which kind of means that I only use stuff I don't care for...crazy, huh? Your cards are so beautiful. I love the colors and fresh design. And as to what I hoard...I admit to hoarding paper and cute embellishments. The cuter they are, the harder they are for me to use....go figure! Beautiful card ! Tks for the chance. Love love love hiw you used he blue in this! 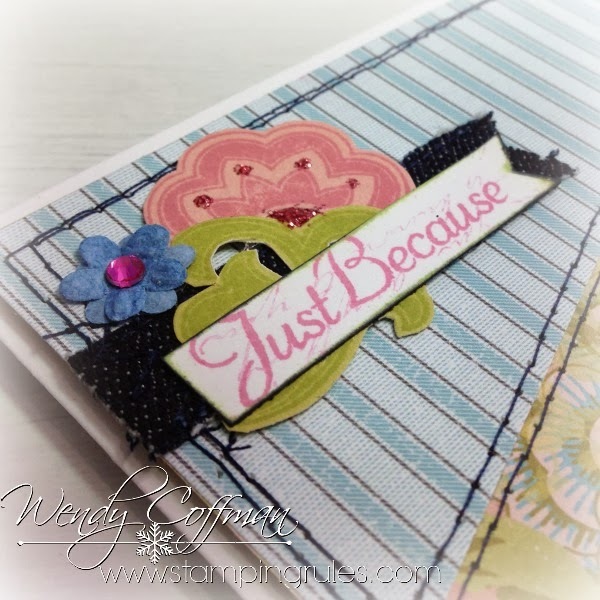 Gorgeous card Wendy! I hoard paper more than anything else.